As 2007 rolls closer, so does the launch of new state of the art golf equipment. 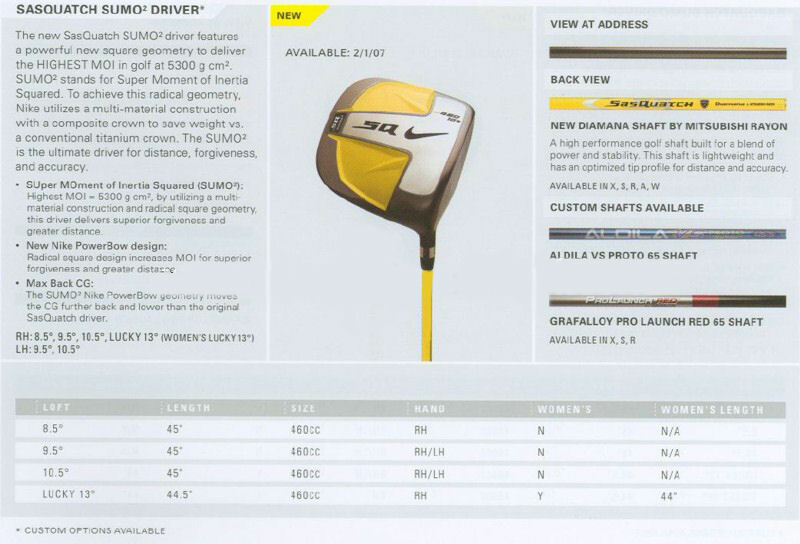 Likely the most widely anticipated launch in '07 is the new square driver. As I have wrote about before, Callaway and Nike will launch the FT-5 (also the FTI) and the Sumo (and Sumo 2) respectively. Nike has already set the launch date for the Sumo as February 1st, 2007. The square drivers, in addition to being a whole new geometric shape, will maximize the center of gravity and moment of inertia potential by use of the square shape as well as the 460 cc head. The Sumo has already captured its first professional win in the hands of K.J. Choi at the Chrysler during September. The Callaway drivers have been in play by many players on the Champions Tour during the closure of the seniors' season. The other equipment news that will rock the golf world is yet to surface. Of course, we can still hope for Santa to carry the market's best equipment in this Christmas. 2006 produced a huge number of innovations that shook up the golf world. Among these releases: the Taylormade R7 425, 460, and Draw , the Ping Rapture woods and irons, Cleveland's Hibore driver, Odyssey 3 ball putter and new two ball putter with Saturn rings. My personal favorite product of the year is the Taylormade R7 425. The R7 425 features a 425 cc driver head with four movable weight ports to change the nature of the club to the player's needs. That means help eliminating the banana ball, or in my case helping to increase flight height and eliminate my hook. My tip to the average golfer for the new year, quit playing the V1 in favor of less spinning ball. The V1 maximizes a player's spin which does not provide the average player with the most distance, and worse that extra spin adds only more slice or hook. Many less expensive balls (such as the Titleist NXT or Nike Juice) will give the average golfer a longer and straighter ball flight. Of course, golf ball choice is entirely based on feel so make sure to demo a sleeve of a new ball before dumping your bag of the old orbs. 0 Response to "Nike Sumo and Sumo 2 On the Way"